You only use a car polish when you need to do some car detailing. Otherwise, there are other ways to keep your car in its showroom condition. A car polish is best used when you notice paint job imperfections on your car or when you want to get rid of those unsightly swirl marks. The wide array of car polishes available in Singapore may intimidate an amateur car owner so it is important to know the important features you may need to consider when it comes to choosing the best car polish for your detailing job. If you’re going to shop around, you’ll discover that car polishes come in different types and forms. The variety of car polishes is also meant to address specific car detailing needs so you can’t just choose a car polish that your neighbor is using. It’s best to consider first what detailing issues you have with your car and discover which among the different types of car polishes is suitable to address the problem. Compounds and Cutting Polishes can solve more complex detailing issues as they are more abrasive. On the other hand, some car polishes such as the types of finishing polishes and paint cleaners are only good for minor flaws and prettying up. While shopping around, you’ll find that there are two forms of car polishes. The first type is the solid form of car polish while the second type is the liquid car polish. Solid car polishes are also known as rubbing compounds. As its name suggests, these rubbing compounds would require you to work harder just to attain that polished look on your car. 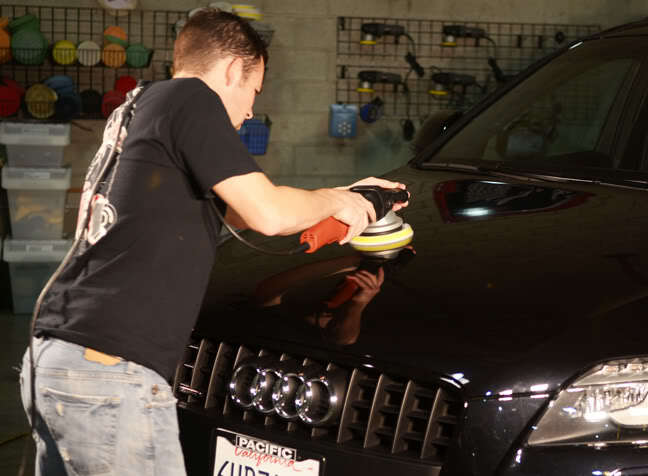 For this reason, most car owners prefer the second type of car polish as these are not labor-intensive but easier to apply and even give off a better result. You may want to look carefully at the description attached on the containers of each car polish before you decide to purchase one. The wide variety of car polish to choose from means there are car polishes designed for different purposes. You’re better off getting a car polish that would answer most of your car detailing needs. Some car polishes are designed mainly as a polish while other car polishes are designed both as a polish and an added protection to your car.